Have great conversations in comfort with this unique sectional. Curved loveseat sections and wedge end table with storage can be set up in whatever configuration best suits your seating needs. Includes an ottoman so everyone can put their feet up. Woven “All Weather” Polyresin over a rust-proof powder coated steel frame. Includes cushions in your choice of indoor/outdoor fabrics. Sunbrella fabrics available for an additional charge. Available in Bordeaux finish. Some assembly may be required. 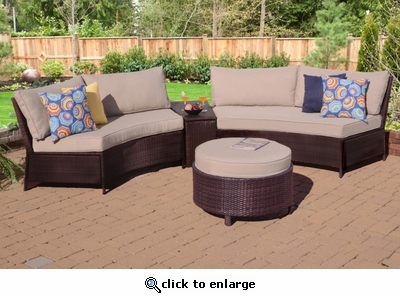 Set of Four includes 2 Loveseat Sections, Wedge End Table, & Ottoman.